In 2018 the Fort Myers Miracle posted an overall record of 68-69. However, on the final day of the second half of the season, the Miracle got a little help and snuck into the playoffs. They carried that opportunity to the Florida State League championship. Several players from that team arrived late in the season and will begin the 2019 campaign with the Miracle. Today we look at the Fort Myers Miracle players and coaching staff. We try to figure out a potential everyday lineup, and discuss the team’s top prospects. Feel free to share any thoughts you may have on the team or roster, and ask as many questions as you would like. After managing in Cedar Rapids in 2018, Toby Gardenhire will spend his first season managing in Ft. Myers in 2019. 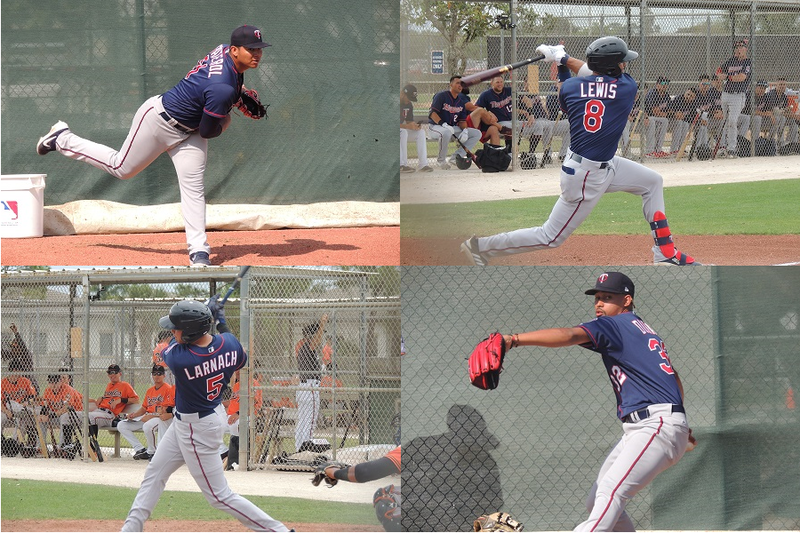 Luis Ramirez has been a pitching coach or coordinator in the Twins system since 2006 when he was in Venezuela. He has spent the last four years in Elizabethton. This is his first season with the Miracle. Matt Borgschulte joined the organization as a coach prior to the 2018 season when he worked in the GCL. He jumps to the Miracle as their hitting coach. Here is a look at the Miracle Opening Day roster. Note that this is a tentative roster and can be updated before their season starts on Thursday. Melvi Acosta, Charlie Barnes, Edwar Colina (IL), Randy Dobnak, Jhoan Duran, Calvin Faucher, Tom Hackimer, Hector Lujan, Bailey Ober, Alex Phillips, Johan Quezada, Alex Robinson (IL), Bryan Sammons, Anthony Vizcaya, Tyler Watson, Lachlan Wells (IL). Royce Lewis (Twins Daily #1 Prospect) - The #1 overall pick in the 2017 draft, Lewis had a strong first full season in pro ball in 2018. He was promoted to the Miracle for the final two months last year and returns to start this season. His prospect status nationally jumped and he is now a consensus top ten guy nationally. Trevor Larnach (Twins Daily #4 Prospect) - The Twins first-round pick in 2018 out of Oregon State where he helped lead the Beavers to a College World Series championship. He signed and played last year in Elizabethton and Cedar Rapids. He homered in his first MLB spring training at-bat this year. Akil Baddoo (Twins Daily #10 Prospect) - Speed, power potential and good plate discipline, Baddoo is an intriguing prospect. After filling out the stat line in 2018 in Cedar Rapids, Baddoo will likely spend the 2019 season with the Miracle. Ryan Jeffers (Twins Daily #13 Prospect) - The Twins surprised many when they used their second-round draft pick in 2018 on the catcher from UNC-Wilmington. He debuted in Elizabethton and put up crazy numbers before moving up to the Kernels for the end of the season. Ben Rortvedt (Twins Daily #14 Prospect) - Rortvedt was the Twins 2nd-round pick in 2016 out of high school in Wisconsin. The strong-armed backstop took major strides forward offensively in 2018 and spent the second-half of 2018 with the Miracle. Jose Miranda (Twins Daily #20 Prospect) - Drafted immediately after Baddoo as a comp pick after the second round in 2016, Miranda really came on strong in the second half of 2018. Ended the season with the Miracle. Will continue to play second base and third base. Huge power potential. Edwar Colina - The Appy League Pitcher of the Year in 2017, Colina markedly improved in 2018. He went 7-4 with a 2.48 ERA before ending the season with a start in Ft. Myers. He also started the Miracle championship game. Blessed with an upper-90s fastball, Colina has a quality three-pitch mix. The Miracle won the Florida State League championship with the help of several players who came up to the team late in the season. Will that group be able to gain a playoff berth before they move up to Pensacola? As you can see, this team is loaded with top prospects. Most of these guys will spend at least the first half of the season with the Miracle, but at that point, any number of players could move up to Pensacola. Jhoan Duran and Edwar Colina are all upper-90s guys in the Miracle rotation. Many will wonder why the Twins aren’t being quite as aggressive with the likes of Trevor Larnach or Ryan Jeffers as they were with Brent Rooker. Rooker spent his first full season of pro ball in A last year. However, he had four years of college whereas Larnach and Jeffers each spent three years in college. That said, don’t be surprised if one or both of these guys end up in AA by the end of the season. Quietly, Michael Helman joins Larnach and Jeffers as 2018 draft picks starting in Ft. Myers. Lewin Diaz was a big dude when he signed as a 16-year-old. Last offseason, he came to camp down about 25 pounds. This offseason, he lost a similar amount and looks fantastic. He missed half of the season with an injury and will look to return to his higher prospect status. Royce Lewis won’t turn 20 until early June. He spent the final six weeks of the 2018 season with the Miracle, so getting him more time in the league is just fine. At the same time in his career (2nd full season), Joe Mauer spent the first half in Ft. Myers and the second half in New Britain (AA). He opened the next season with the big league club. Ladies and Gentlemen-- may we introduce the 2023 Minnesota Twins! Hopefully several are knocking on the door by the end of 2020. I had Barnes in AA as he was pretty dominant the second half.My dream of Enlow, Balazioic, Duran and Graterol starting coming up together appears to be dead.Enlow and Balazovic start in A ball which stinks but it looks like Graterol will be AA bound so that is good news. Will be interesting to see how Jeffers, Larnach and Helman do in High A.I am hoping for good things from those picks.I also thought Ernie would start here but he must have made it to AA so that is good as well. I'm really rooting for Rortvedt to continue developing well on offense. I'd love for him to get a mid-season promotion and stay on a good path to the majors. Looking forward to seeing how Larnach does in what's generally seen as more of a pitcher's league. He was expected to crush it in cedar rapids (IMHO); the jumps get a little harder now, but he's got the talent to succeed. Top-to-bottom, the farm system has vastly improved. I had thought Lewis would be in AA to begin the year. I don't really get why they'd want to have Rortvedt and Jeffers at the same level, or that many infielders who should be starting somewhere. IMO, Jeffers and Rortvedt should both be starting somewhere. Also think that either Blankenhorn or Miranda should be at another level. Miranda should be playing everyday. Hope this loaded roster doesn't force Helman to the bench too often. Very interested in seeing him destroy baseballs. This group could certainly repeat as FSL champs.Unfortunately, when the playoffs come around most of the starters will be in northern Florida. Will be interesting to see the split in playing time behind the plate for Ben and Jeffers.Looking for both to have impressive seasons with the bat.And a pleasant surprise to see Helman with this group less than a year after being drafted. That lineup has star potential.8 of the 9 positions are top 30 guys in the Twins system.If you still believe in Diaz as top 30 player then make it 9 out of 9.The pitching is better at High A so I would expect some of the younger players to struggle but what a fun lineup to box score watch. Maybe... but Rortvedt isn't ready for AA, and Jeffers is too good for the MWL probably. My assumption is they'll have pretty close to a 50/50 split in terms of catching, but Jeffers should get time as a DH too (which is why my roster guess had a third catcher there). Guys are going to get days off. I think you can work it such that most of them are in the lineup 5 times a week. That's good as most of these guys are young and very early in their minor league careers. I was surprised with how aggressive they were with Helman throughout spring training. I don't know if the term "destroy pitches" really works with him. He is a line drive hitter, not much power yet. I assumed he would be in Ft. Myers to start since he only had like 6 weeks with the Miracle last year. Then with the oblique injury, that cost him some time in spring training, it became almost a given. The only thing that had me wondering was if they would be willing to push him up to Pensacola to appease the new affiliate. And because he's really good. I think if he gets off to a good start, Seth, he will move up to AA quickly.Wouldn't surprise me to see him there by May 1. Seth stole my thunder on this, but yes, Jeffers bat will play at DH when not catching. Now, what I don't know is whether he can/will play a little 1B as well. The Twins haven't been shy about having their catchers try on a 1B glove here and there. I see your point about having Blenkenhorn and Miranda on the same squad, but in reality, Blenkenhorn doesn't seem ready for AA yet and Miranda is ready for A+ ball. But remember, each of those two also play some 2B. Additionally, Blenkenhorn has seem some OF time as well. It's really up to Gardenhire to move the guys around and make sure they all play consistently. That would be fantastic... man, he looks great, clearly he put in a lot of work in the last year despite the injuries. He can hit too, didn't lose any of the power. Gardenhire has some say in that decision, but all of those types of decisions will come from on top with opinions taken from all over. I'm really impressed by the communication up and down the system, including (I think) with the players too. They'll find a way to keep them all playing and many of them will be made more versatile. Miranda got some time at SS this spring and that can be a good thing to keep his athleticism. May be wise to get Lewis some innings at 3B and in CF. Blankenhorn can play all over, one of the best athletes in the organization. Lineup construction from day-to-day will sure be interesting. A couple questions to toss your way for comment/opinion. 1] There is obviously a TON of SS talent in the system now, from Polanco on down, but it seems they gave up on Miranda at the spot early on. Is that more about depth, or his growing out of the position, or just not having the range/hands? 2] When the Twins selected Blenkenhorn and Cabbage in the same draft, I thought they got a couple of great athletes who could be huge steals. (Steals being a relative term as they were fairly high slections). We have seen real flashes from Blenkenhorn, far less from Cabbage at this point. At this point, really interested to hear what you think about those two going forward. Let's hope so. They had the most money that year, and picked the wrong guy so far, by far. I see Colina listed on the IL. What is his injury and how long is he out? This is again a solid group of high draft picks. They could really knock the ball around, and out of the ballpark, while causing havoc on the bases with all that speed from Baddoo, Lewis, and Blank. We’re actually heading down for the opening series. Should be fun. With Blank and Cabbage, I thought the same as DocBauers. They both seem to be great athletes who happen to be really good at baseball, and not baseball players who happen to be really good athletes. Appreciate the comments! A couple questions to toss your way for comment/opinion. 1] There is obviously a TON of SS talent in the system now, from Polanco on down, but it seems they gave up on Miranda at the spot early on. Is that more about depth, or his growing out of the position, or just not having the range/hands? 2] When the Twins selected Blenkenhorn and Cabbage in the same draft, I thought they got a couple of great athletes who could be huge steals. (Steals being a relative term as they were fairly high slections). We have seen real flashes from Blenkenhorn, far less from Cabbage at this point. At this point, really interested to hear what you think about those two going forward. For Miranda it's about growing out of the position. Most think he's a natural third baseman. He's big and strong. He's done OK athletically at second base now as well. But obviously the depth is part of it too. Blankenhorn and Cabbage are both really good athletes. Cabbage is bigger and probably stronger,, but there's been the swing and miss. Very capable at 1B and in the corner outfield spots. It'll be important for him to get off to a fast start. Blankenhorn being back in FM is probably as much about the numbers as anything. He's big, strong and fast. Not great defensively, but capable at 2B and 3B. Fair to say it's a big year for both though. 1) The Twins clearly had a down year in 2013, with only Jose Martinez and Robert Molina still alive. But they spent their allotment, which has consistently been a source of skepticism for you and others. A few teams spent amounts close to the $2.9M the Twins spent. Texas spent $7.6M. 2) They sandwiched a tough year between two that might be pretty good, with Thorpe, Hu, and Quezada all still alive from 2012, and Graterol, Ynoa, Arias, Wells, and Moises Gomez still alive from 2014. We need to consider how few of these prospects pan out. 3) For example, the Yankees spent $8.8M in 2012 and $10.6M in 2014. In fact, they signed 10 of the top 20 ranked prospects in 2014. It's early but I don't believe a single one of the two dozen prospects from those years is on their roster, and very few of them even got non-roster invites to training camp. This is just to say the Twins may or may not have fumbled the ball with Lewin Diaz at $1.5M, but it's a slippery ball to begin with. Just ask the team who took a shot at Yasmani Tomas, about whom the Twins were roundly criticized for passing up, right? The competitive landscape has vastly improved since 2013 because of the joint facility they now have in the DR. I think they're a player now.